I posted some pics of this guy when he was being built and I figured I would show you all the finished model too. 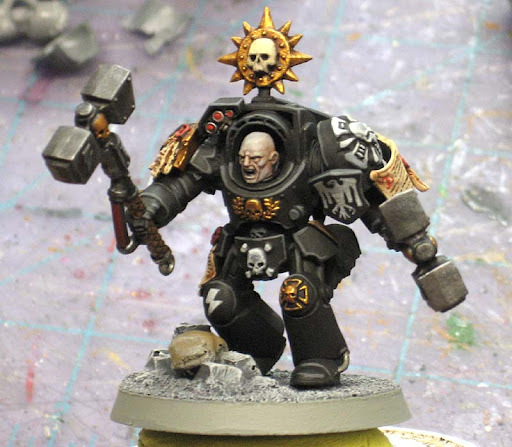 He rounds out all the Raven Guard models I've been doing for a friend of mine. I'm hoping to get my hands on another Raven Guard Tactical squad and Drop Pod in the coming weeks. All of these Raven Guard conversions are fantastic! 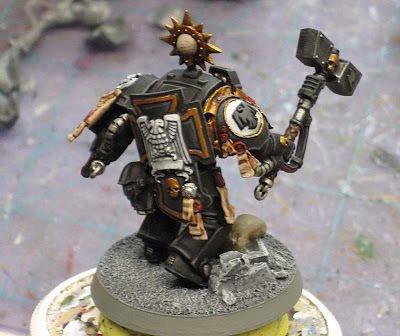 I especially like the sculpted chapter symbol you've done on the models' shoulders and other areas. lovely work as always Ron, have you a how to with the black? or is that in a previous post somewhere? Like Anton asked, it'd be great to see a note on how you did that black. It's a lot softer and more solid looking than many works. Excellent conversion. A fine looking job! Great work again Ron. The custom raised raven guard chapter symbol is a particular highlight for me, as well as the attention to detail of the end of the handle on the left-hand hammer. I've done on my Storm Wardens project). I will see if I can put together something new and up to date.